Linzer cookie dough is notoriously difficult. It’s very soft and crumbly and cracks easily, and because it’s basically butter, sugar and flour, it’s very greasy. You know what that means? That means dough that spreads, baby. Somehow I neglected to remember this, so I happily put all of my little rounds onto my new silicone baking mat, cramming them all together so I could fit them, chilled them for a bit (after chilling them for half an hour so that I could actually roll it out without it melting in my hands) and then put them in the oven. Aaaand twenty-five minutes later I took them out. Oh whoops. They’re slightly over-cooked and burnt. And, oh whoops, they’ve spread out, stuck to one another and some of them are now square and look like weird, misshapen bits of dried up toast. OH, and WHOOPS – I should’ve taken the rounds out of the centre when I cut them out because they’ve stuck back to the rest of the cookie. It’s hard to describe the immense sense of disappointment that I felt upon seeing these little (or rather grotesquely large) disasters (and subsequently upon stabbing the rounds out from the middle of the supposed-to-be cutout halves, whilst cursing under my breath my foolishness). Not only that but they were from a recipe by Ina Garten, my domestic goddess, a cook who has never failed me before. Considering how the whole thing had taken me a good hour and a half to make it just felt like a total waste of time. I tried stacking a couple on top of one another, just to see if it was worth giving them the guava jam treatment or if I was better off chucking them all in the bin, and frankly some of them looked like I’d sat on a cookie then shoved it on top of a burnt piece of toast. However, we live and we learn, right? So I decided to shrug off the disappointment, fit them together as best I could (and at this point I was actually fighting Momma Lee for them, who was breaking off bits and eating them when I wasn’t watching), slather the bottom half with guava jam, icing sugar the top half and shove them back together. The result was the above. But those were the three prettiest and most round. Some of the others… well. Just not worth even showing you how much of a disaster they were. I’m bringing them all to work tomorrow for myself and my colleague Hannah, and maybe I’ll drop one off to Antonio… but then again maybe I’ll wait until I’ve perfected these so that they’re not quite so terrible looking. Then again, I could just re-brand them as “homemade” and “rustic”… but not so sure that’ll work for some of them, still! 12oz unsalted butter, at room temp. 2. In a large bowl, cream the butter and sugar together until just combined. This is why it’s important to have room temperature butter. 3. Add the vanilla and combine. 4. In another bowl, sift together the flour and salt, then add them to the butter mixture. Mix until the dough comes together. 5. Dust a surface with flour and shape into a flat disk. Wrap in cling film and chill in the fridge for 30 mins. 6. Take the dough out of the fridge, place onto a floured surface and roll the dough out to a 1/4″ thickness, then cut into 3/4″ rounds, making two for every cookie. With half of the rounds, cut a hole from the middle of each round in any shape you like – I went with circles. Remove the rounds from the middle of each cookie half. 7. Place all the cookies on an ungreased baking sheet (or silicone baking mat, if using) and chill for 15 mins in the fridge again. 8. 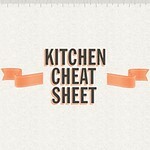 Take out of the fridge and place into your pre-heated oven. Bake for 20-25 mins, until the edges begin to brown. Watch carefully and do not allow to even begin to singe, as it will compromise the flavour of the cookies. 9. Remove to a wire cooling rack and allow to cool to room temperature. 10. Using a teaspoon, scoop a little of the guava jam into the centre of the solid cookies and spread it around with the back of the spoon. 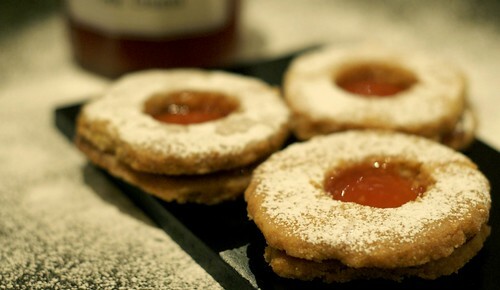 Dust the top of the cut-out cookies with icing sugar and press the two flat sides together, with the guava jam in the middle and the confectioners’ sugar on the top. 11. Serve with tea, if you’re so inclined, and I sincerely hope that your cookies are actually round and not strange little misshapen cookie disasters like mine. There you have it, then. Hope you can enjoy them, even if they are a little bizarre looking. They do taste pretty good, so I’m glad I didn’t chuck ’em, but am now wondering if the guava jam wouldn’t go a little better with something savoury…? Watch this space. Until next time, peace and love. As long as it tastes good, I always say! :) And despite their un-prettiness, I still have cookie envy! I think they look pretty…and I'm sure they didn't taste half bad! You are a baker…you just have to dig deep…you'll find that inner baker inside of you :-) But even if you are not…you can always let friends like me bake you lots of goodies! Much love! Jax, the three pictured look fine, so I wouldn't write off baking just yet…besides, it does take time to master technique with doughs and such. Not to mention that Mamma Lee liked them, and I'm sure she's no pushover when it comes to food. You know what? It doesn't matter how they look… as long as they taste good. And with those three ingredients, you can't go wrong. I'm a huge fan of these cookies and am salivating as I read your post. Nom nom nom! I don't think these look bad at all…but I do know the feeling of spending a lot of time on something and it not turning out the way you intended. It feels like such a waste of time. But I'm glad you salvaged them – and I bet they're scrumptious with the quava jam! They seem to have Momma Lee's approval and for a disappointments they look delicious. MK – ha, thanks love and thank you for the suggestion! Something to work on, at least? Brian – I'm sure you could make these much better than I've done, but thank you for such a lovely comment! DDC – thank you =) And thanks for swinging by! Ash – ha, well honestly they weren't half bad. The biscuit was perhaps a little too cooked, just bordering on singed, but the jam and the icing sugar hid a multitude of sins. You should try them out (and use any jam you like) and let me know if you have any better luck! Your kids would probably love them!